Found Object: The Dancers | PROOF OF GOD! ...and other tragedies. There is a place down by the river where a person is liable to finds things that have washed up. It’s a little bend, where things are cast out of the broad flow of the tides, and slowly sucked and rolled up onto the banks, often clogged with mud and with just an edge exposed, the curve of a bottle or the shard of a plate. One summer, I found a big brown glass bottle of the old sort, the kind that maybe a hospital might have, for holding milk of magnesia or some other sort of common medicine. It may have also been a whiskey bottle, though I don’t know enough about whiskey bottles to know what they used to look like. I guess just about anything could be used for a whiskey bottle and so it doesn’t matter anyway. That same summer, I found the small, broken figure that I call The Dancers. It was a rare find, something purely decorative, with no use at all but to be pretty to someone. Of course, by the time I found the figurine, the dancers had no heads and no feet. Nonetheless, the blue of the fellow’s jacket was still like a sky at twilight and the lady’s dress had not been broken. 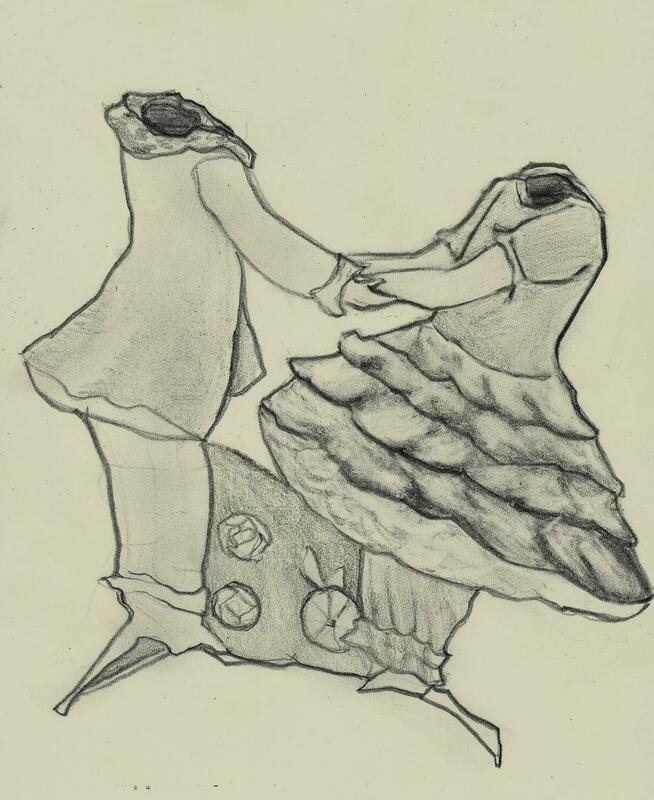 Their arms made a bridge between the two figures, and so though they had no heads and no feet, they had fine clothes for dancing and their hands were clasped as if caught mid-twirl, with the woman leaning back just a bit and her petticoat making a big solid curve beneath the ruffled dull pink layers of her party dress. She wore bloomers beneath and a small strip of black glaze beneath them suggest sensible shoes had been painted onto the feet long broken. My family used to throw their garbage in the river, a long time ago, decades and decades before I was born, when the land was a wilderness and the white house was the only structure in all those oaks, all that bramble and thicket and bluff, when all the roads were dirt, impassable in certain summer rains. The garbage was thrown into a big ditch that ran behind the workshed that was set some ways off from the white house. Anything they needed to throw away was either burnt or tossed into the ditch. Even when I was growing up, that little dip in the land was filled with the remnants of all sorts of garbage, plastics and glass and pieces of broken furniture, the twisted frame of an aluminum lawn chair. I don’t know if The Dancers came from those near forgotten piles of trash that the tides must have licked at when the moon was full and the waters were high. The Dancers are not fine china. They are cheap, like something from a dime store, a drug store. They have no detail and, though obviously dancing, no grace. I wonder how they lost their heads. Were they broken before they were thrown into the river, in some way or another, or did the river itself pummel them somehow. It’s seems like it’d be hard for a tide, or even a storm, to break pottery. Water is soft, though it does weaken things. However, The Dancers were not broken softly.